Simple house situated in the quiet residential area of Mas Guelo (Blanes) , 2 Km from the beach and the village centre.The house has a small dining room (TV and fire place), a fully equipped kitchen(washer machine, microwave, dishwasher...).It has 3 bedrooms (2 double bedrooms and 1 twin bedrrom) and 2 complete bathrooms (1 with a bath and the other with a shower). 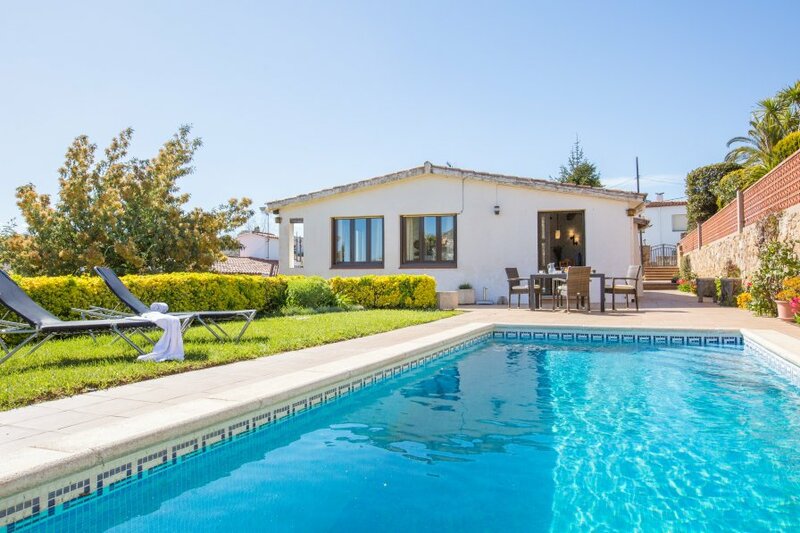 There is a small terrace next to a beautiful and nice exterior area with a 3x7m pool and barbecue. Mountain views and garage for 2 cars. The car is very recommended to could go to the beach and to the centre of the village, so this is not possible to go walking and there're no much buses in the area. The nearest beach Is Blanes. Umbrellas and deck chairs are provided to rent as well as activities like pedal boats, and canoeing. Also you can taste the Mediterranean food and , fish , paellas and all kind, in the restaurants placed on the beach and in all the village. Near the village you can also enjoy two big waterparks: Marineland and Waterworld.